10/30/11 – 2011 OCTOBER HORROR MOVIE RECOMMENDATION #30 – Alien. | Musings of a Scary Horror Writer. 10/30/11 – 2011 OCTOBER HORROR MOVIE RECOMMENDATION #30 – Alien. Another common theme day. Last year on this day I chose Aliens, so this year it’s kind of an “of course” moment to choose Alien. It only makes sense since both of these movies create a perfect one-two punch. I’ve already talked at length about Aliens, which is almost more of an action-war movie, so this time I get to talk about Alien, which is a pure horror movie through and through. 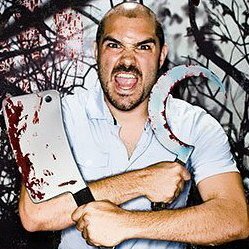 Hell, if you want to really get down to it, it’s almost like a bigger budgeted slasher flick, just put in space instead of the woods. Still, I don’t think Ridley Scott has any idea what he fully did for the world when he brought us this masterpiece. It changed the landscape. Alien floored us. Now it almost seems like a cliché, but before this movie came out, the whole chestbursting alien idea was pretty much the most awful thing anyone could ever dream of. I mean, something gestating inside of you, growing, changing, until when you least expect it, BURSTS out of you from the inside out. That scene will always still blow my mind. I can only imagine what it did to expectant mothers at the time. But let’s talk about the look and atmosphere of this movie. The art direction, the mood, the effects. Before this movie came out, H.R. Giger and his style was not nearly as known. Now, you’d be hard pressed to find an alien creature or science fiction design in films that doesn’t bear at least some resemblance to H.R. Giger’s art. It literally became the template for what sci-fi/horror would be from here on out. Not many movies can say that. Look, the movie is about as good as it gets, what else can I honestly say. 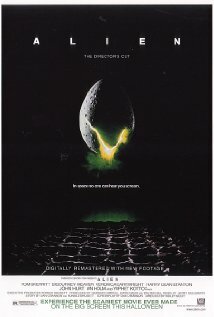 The amazingly perfect tagline for this movie was, “In space, no one can hear you scream.” Well, after watching this movie with countless people over the years, I can pretty much guarantee you’ll be hearing your friends scream nice and loud. Such an amazing treat for the senses. Enjoy. This entry was posted in Horror Movie Recommendations 2011 and tagged alien, H.R. Giger, Halloween, horror, horror movie recommendations, horror movies, movies, Ridley Scott, Sci-Fi, Sigourney Weaver. Bookmark the permalink. FLASHBACK 2010 PICK – 10/30/10 – OCTOBER HORROR MOVIE RECOMMENDATION #30 – Aliens. FLASHBACK 2010 PICK – 10/31/10 – OCTOBER HORROR MOVIE RECOMMENDATION #31 – Martyrs.